I have especially vivid memories of traveling with Ven. Maha Ghosananda on a pilgrimage we took in 1987 with Zen Master Seung Sahn, Dae Soen Sa Nim, to the great Zen temples of Korea. Everyone, Zen teachers and students, would be dying of heat and tiredness, and as soon as we arrived at a monastery for the night, most of us would have only one thought: to lie down and sleep. Or maybe: to eat, lie down and sleep. 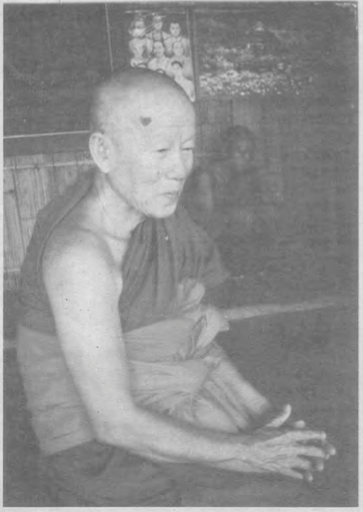 Maha Ghosananda would get off the bus without any stuff to schlep, wearing his wool hat and socks in the heat and humidity. He would find a path or a stone wall and start doing walking meditation in the twilight and on into the night, back and forth, back and forth. Along with Korean monastic dignitaries and some Western teachers, Maha Ghosananda was invited to give a Dharma talk at a huge gathering called “The Whole World Is a Single Flower” in honor of Dae Soen Sa Nim’s sixtieth birthday. The celebration was attended by many hundreds of monastics and some of us laypeople. When it was his turn to speak, Maha Ghosananda stood up, in his simple Theravadan robes, and said softly in the language of the country that colonized his: “Je suis, tu es, il est, elle est, nous sommes, vous êtes, ils sont, elles sont.” He stood at the podium and quietly, slowly, conjugated the verb être, “to be”: I am, you are, it is, he is, she is, we are, you are, they are. . . . It was 1987, before the genocide in Cambodia had ended. Maha Ghosananda held both truths—the truth of emptiness, the open field of being, and the truth of his work in the refugee camps with survivors of the killing fields, where he had lost over a dozen of his immediate family members, all his brothers and sisters. None of this went through our heads; it didn’t have to. Words were not necessary, and the majority of the people there couldn’t understand French anyway. It didn’t matter. His presence standing there—soft, humble, quiet—said it all. It was a powerful transmission. We sat and wept. Trudy Goodman is a senior Dharma teacher who has practiced in the Theravada and Zen traditions since 1974. She founded Insight LA and cofounded Growing Spirit (for families) and the Center for Mindfulness and Psychotherapy in Los Angeles, and the Institute for Meditation and Psychotherapy in Boston.